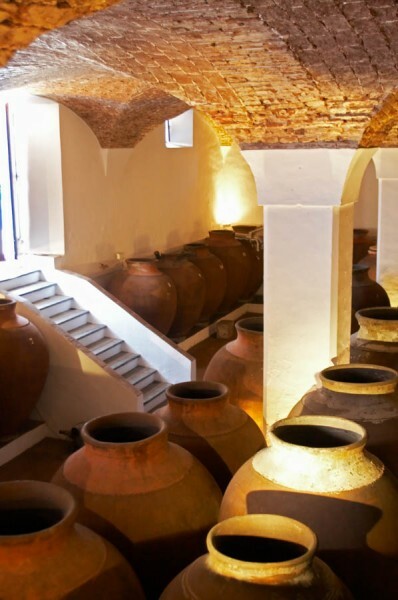 You are here: Home › Blog › Wine producers have started making wine in amphora. Again. The amphora is back. The ancient way of making and storing wine in clay amphora, like the Greeks and the Romans did, is high fashion today. Although the number of amphorae users is quite low they are very much talked about and as they often belong to the natural wine movement they have received a lot of attention lately. And some of them deserve the attention they get. An amphorae is made of clay and come in different sizes. They can be used for fermentation and/or ageing of wines, both red and white. They can be buried in the ground, half buried or not buried at all. The first question you ask yourself is why people use them in our day and age. It does not feel like the most obvious choice. Fresh and soft, fine tannins. Dark berries and herbs from Provence. Easy to enjoy but still a complex and full bodied wine. Philippe Viret at Domaine Viret in the southern Rhone Valley has experimented since 2005 with fermentation and ageing in amphora. He has also inspired many others to try it. Philippe is currently producing a series of three different amphora wines. And more are coming. The wines are made without any additives at all; they are as natural as a wine can be. None of them have any added sulphur. The grape is Muscat à petits grains with six months of skin contact. As always with such a long skin contact the wine turns out a bit special. I like the style but it is a style you have to get used to. The beautiful color is dark amber and the flavours are rich and intense. There are hints of apricots and citrus and a slightly dry bitterness in the after taste. The typical aromatic muscat character is very discreet. The wine is bone dry. Grenache, syrah, carignan and mourvèdre. Good and very generous fruit. Smooth on the palate but with good acidity and freshness. Interesting wine with a stunning fruit. I love it. 100% Grenache with a little more mature style. Slightly oxidized, dried fruit, feels a bit sweet, but there is no residual sugar left. You feel the high alcohol a bit but with for instance a strong cheese it should not be a problem. Jean Claude Lapalu in Brouilly in Beaujolais was inspired by Philippe Viret. Jean Claude has 13 hectares in total, making 55 000 bottles, but so far only a small part of his Brouilly is made in amphora. This year he is also making a white wine in amphora for the first time. He bought his 400-liter amphorae in 2009. “I immediately noticed that the wines are different. The taste is cleaner and they have a more pronounced minerality, “he says. He runs his whole property organically and try to keep the added sulphur to a minimum. “Long ageing stabilizes the wines and you don’t have to add any sulphur,” he says. Grape bunches are destemmed and fermented and macerated 45-60 days in concrete tanks. After pressing the wine is aged in 400-liter amphoras. The wine has a very pleasant and generous fruit, aromas of dark cherries, good length and aftertaste. He uses amphoras both for fermentation and ageing and often has long skin contact. The grape is grecanico. 8 months of ageing in the amphora. Rich texture and taste. Good freshness and a dry, long finish. 8 months of skin contact in the amphora gives, oddly enough, elegance and finesse to this fairly easy-to-drink and fruity wine which reminds me a bit of a pinot noir. Elisabetta Foradori is a well known winemaker in Trentino Alto Adige in northern Italy. She has 70 amphorae which is quite a lot. So she has a relatively large production of amphora wine. She enjoys working with clay. “The wines get a cleaner flavour if they are made in a clay amphora,” she says. Elisabetta’s estate is run biodynamically. She first became known to the world through her fantastic wines made from local grape teroldego. Finesse, fruit, elegant with good structure. White wine made from the grape nisiola. The wine gets 7 months of skin contact in the amphora. This is a grape, says Elisabetta, which can be aged for a long time. Lovely fruit, white flower aromas, good freshness. A lot of texture and body. Great fruit, intense flavors, black currant, black cherry, great class and complexity. In Georgia, situated very close to where man started cultivating vines (it is said), they also have a long tradition of using amphoras. Good choice of name? Côte, coteaux or not? 20 Responses to Wine producers have started making wine in amphora. Again. I’ve started to make amphorae here in WA State for domestic producers. Would love to talk to US producers who might be interested in exploring winemaking in one. Celia, I am very interested in investigating this in the Northwest. I am in Portland and a student in the Northwest Wine Studies program at Chemeketa Community College, as well as having a background in ceramics. Are you making amphora or wine using them? Or both? I apologize for not responding sooner. I am now just seeing this. I wish I could help you at this time but I have lost the potter I was using and am in search of a new potter to make amphorae. I will reach out to you should I have vessels to offer! Good luck with harvest and the 2016 vintage! We here at Olalla Vineyard and Winery in Olalla, Washington recently started using clay amphorae from Italy for our primary fermentation. 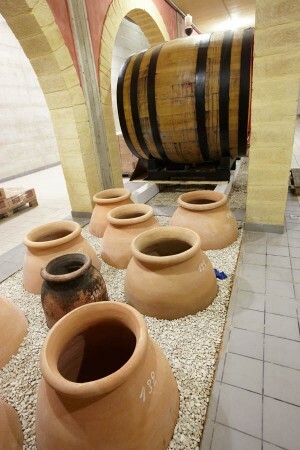 We are currently using three 300 liter amphorae and one 500 liter amphora for white wine. The 500 liter has a bee wax lining. This is our first year using the amphorae and are excited to see and taste the results! Strange with a bee wax lining. Don’t think I’ve seen that. Will it not give some flavour to the wine? I know that when making beer in amphorae, the bee wax lining can impart a slight honey taste. We are using our bee wax lined amphora just for white wine as per our winemaker. It will be interesting to see how it affects the taste, if at all. Mary Ellen, where would you recommend to buy amphorae? We purchased our amphorae from Manu at iPak. You can see them at http://www.ipakwine.com. Four years ago, when this article was written, using amphorae was exotic and unusual. Since then it has almost become high fashion. That is perhaps exaggerating a bit but you see it a bit here and there. Always on a small scale of course. On a recent project in Champagne we even saw several champagne producers working with amphorae. You’re right. That is an exaggeration. It’s not exotic, seeing as amphorae are part of the origin of Western wine-making. It’s just the way it was prepared most of the time. Just ask every Mediterranean super-power that’s been around. It is unusual right now, though. As for this being fashionable, that seems like a stretch. It’s an over-used term these days. The smallest size of Amphora I have found in te text is 300 litres, but some of the photographic evidence points to smaller quantities. How “micro” can you get with this method, and if you would like to store only (i.e. are not a producer but have a wine cellar and live in a wine-producing region is the amphora a good way to transfer purchased new wine in order to mature? I’ve seen many different sizes and indeed quite small ones. (as you can see on the pictures as you point out) How small exactly? Can’t really say. One should perhaps also keep in mind that much of this is experimental. Only a few do it full-scale commercially. So size, shape, material etc can vary widely. Our amphorae are 300 and 500 litres. We use them for the primary fermentation only. I would not recommend storing wine in them. This lady is based in Las Vegas. She makes amphorae and other historical types of pottery.